Click on the images to open a page with a larger photo and more information. 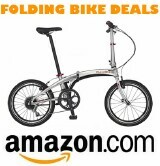 These bikes can be compared to other folding bicycles in the Folding Bike Buyer's Guide. Copyright © 2005-2016 Folding Cyclist Inc. All Rights Reserved. "The Folding Cyclist” is a trademark of Folding Cyclist Inc. Other marks are the property of their respective owners.